Grassland-nesting bird populations have been on the decline for over 50 years! Grassland bird species that may be found in Massachusetts include the vesper sparrow, bobolink, eastern meadowlark, grasshopper sparrow, and upland sandpiper. Due to the size of the open grasslands at Ridge Hill, the most likely species to be observed are the vesper sparrow and bobolink. Why are these bird species on the decline? Grassland birds need large areas of land to lay their eggs, but human encroachment, poor agricultural practices, and natural processes are shrinking their space. Two of the most common species of concern, the Vesper Sparrow and the Bobolink, need at least 10 and 15 acres, respectively. Maintaining a large, undisturbed grassland area such as we have at Ridge Hill Reservation is crucial for the recovery of these amazing birds. The grassland areas of Ridge Hill are monitored by Conservation Division staff. Mowing is initiated on an as-needed basis to prevent overgrowth by undesirable non-grassland plant species (i.e., tree and shrubs). In recent years, several volunteer groups have worked to manage vegetation and re-establish open areas of grassland. If you have a group that would like to help maintain the grasslands, please contact us. For more information on the conservation of grassland birds, click HERE for a publication from MassAudubon or click HERE for a publication entitled: "An Action Plan for the Conservation of State-listed Obligate Grassland Birds in Massachusetts." Please contact the Needham Conservation Department with any information about the sightings of nesting grassland birds in Needham. 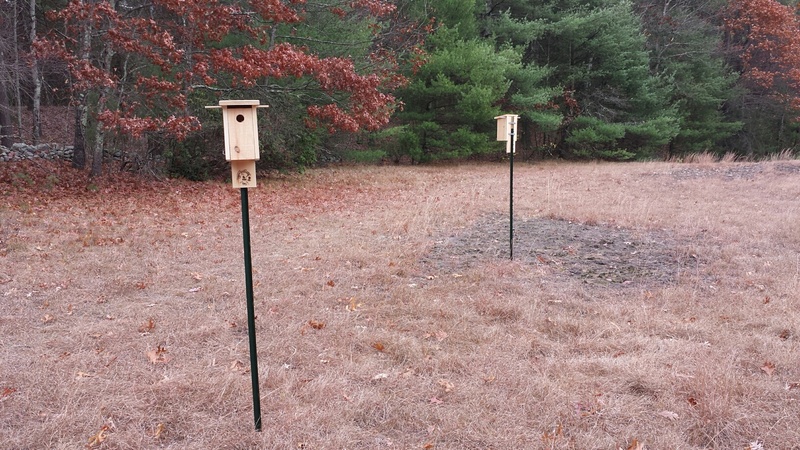 Visitors will notice a number of wooden nest boxes within the grassland meadows at Ridge Hill Reservation. These boxes are installed and maintained by the Conservation Division to support several cavity nesting bird species including the eastern bluebird (Sialia sialis), tree swallow (Tachycineta bicolor), and American kestrel (Falco sparverius). 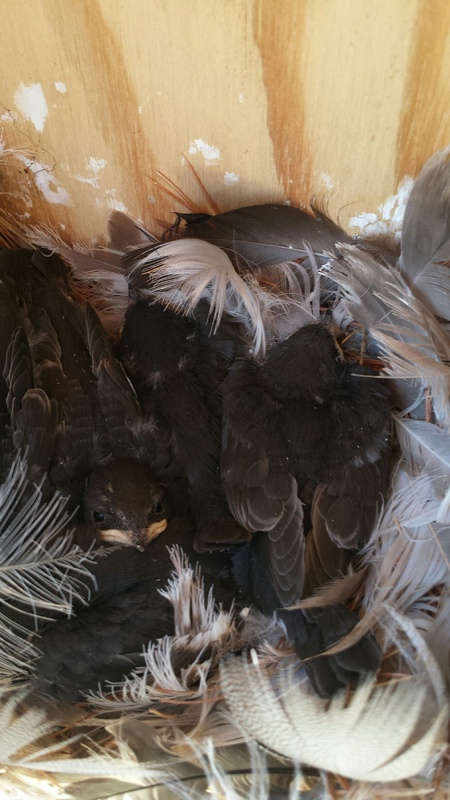 The smaller and more numerous boxes house nesting pairs of bluebirds and swallows each summer. 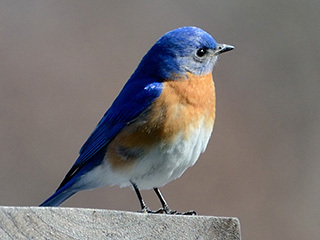 The conservation of eastern bluebirds is considered a success. The use of pesticides and competition from house sparrows in the early and mid-20th century negatively impacted bluebirds and populations were in significant decline. In the past several decades, the combination of public education and establishment of habitat (such as open meadows with suitably sized nest boxes) has resulted in their recovery. Population levels are currently stable or increasing both as summer breeding and overwintering birds. 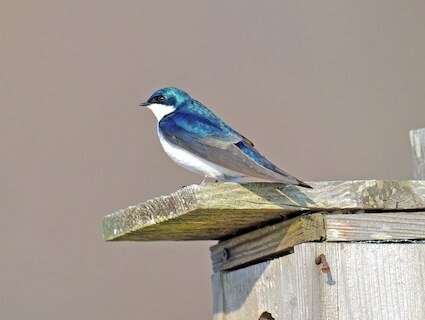 Tree swallows are the acrobats of the Ridge Hill skies. Adults will hunt on the wing, snatching insects from the sky. By doing so, they are effective at controlling insect populations and are considered a very beneficial species. 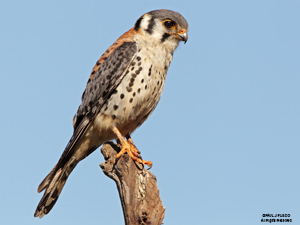 The larger nest box in the western meadow was installed in 2015 to promote nesting of American kestrel. The kestrel is our smallest native bird of prey and historically was quite abundant and would have been found hunting insects and small mammals in the grasslands. Currently, populations of the kestrel are in severe peril due to habitat loss, especially a loss of suitable natural nesting cavities. To date, we have not seen the box used by any kestrel. If you see a kestrel at the Reservation, please contact us!